There were two major appointments made in glossy media this year: one was Edward Enniful stepping into the top job at Vogue, the other was the surprise announcement that CNN's award-winning digital guru Samantha Barry was to be the new Editor in Chief at US Glamour. 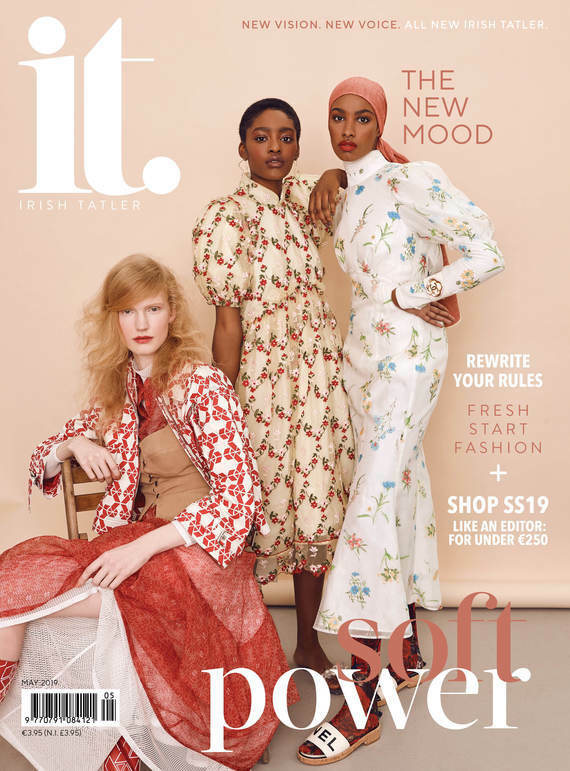 Now nine months in, the Cork woman (who Anna Wintour reportedly groomed for the post) has just announced that Glamour is to cease printing to focus on its digital proposition. "As an editor, I needed to make a decision on where we put the investment and how we grow our audience and our revenue," she tells me as we hang back after her talk at Dublin's The Ivy. It was part of the An Post Early Bird series which closed the restaurant to host a who's who of Irish marketing and media professionals, hanging on Barry's every word. "I understand that some people have nostalgia for their favourite Glamour that they got every month, but for me it was a decision about continuing to grow the Glamour story telling." Coming straight from a post at one of the world's busiest newsrooms, CNN, where she led the digital team to be one of the most progressive social media outlets for news, Barry maintains that moving over to a glossy fashion and beauty brand is not as big a leap as you might think. "I’ve worked in broadcast, I’ve worked in radio, I’ve worked in TV - yes, a lot of my experience recently has been in digital, especially doing social at CNN, but I’m really interested in telling stories across platforms." "I don’t think I could have been more excited to come in and run a women’s title than in 2018," Barry continues. "If you think about how not only in America, but globally, how women are at the forefront of every story. Whether that be around #MeToo, whether it be around running [for election], women in the economy… so I was really excited to come and run a women’s title in a moment when there’s so much story telling around women." Women's empowerment has been a big theme in Glamour's new world under Samantha Barry. First, it relaunched with a bold new masthead, then it tackled issues not necessarily the norm for women's titles - money, being a big one. And in November, there was the incredible three day Women of the Year summit which culminated in the awards ceremony where Chrissy Tiegan, Viola Davis and Hillary Clinton were among the eight honourees to join Barry on the Glamour stage. Not one to humblebrag, Barry maintains that she is merely continuing the legacy of the brand. "Glamour was one of the first magazines in America to talk about domestic violence. They were the first ones to put a black woman on the cover of a fashion magazine. I come from a background where I love telling those stories, but I don’t think you’d find a women’s magazine out there that hasn’t been telling those stories." Of course, moving from news to Condé Nast house has more than one distinct difference, and an elevation in the wardrobe stakes was definitely up there. "If you work in a building where it’s Vogue and Vanity Fair and Anna Winter is your boss, a lot of people are like: how do you get dressed every day?! Sometimes I just drag myself into work, honestly! And sometimes I make an effort." "I come from newsrooms where I definitely thought I was up there with the best dressed. I could never be the best-dressed in that Conde Nast building! So yeah, you see some amazing outfits. Especially if you go to the fashion floor, they really know how to put things together, it’s impressive!" Speaking of Anna Wintour, how is it working for the most notorious woman in fashion? "We see each other a lot of times every week," she tells me. "I love working with and for her. If you were to ask anybody who hadn’t worked in publishing before who would be their ideal person who could walk them through their first couple of months, you couldn’t ask for better. I’m a really big fan of hers - she’s really straightforward. And that’s one of my favourite things in any boss I’ve ever worked for - open honesty and straight-forwardness." So her reputation would allude. "It’s interesting! I think in popular culture people can get characterised in a way that they're not. She’s got a great sense of humour, which I don’t think comes across in people’s perception. Yes, she’s straightforward, but most male executives at the top of their business are as well and they’re probably not called ‘formidable’!" If Samantha Barry seems totally at ease with popping into Anna Wintour's office or sharing a stage with Hillary Clinton, that's because she is. It's something she puts down to her Irishness, which she is constantly and proudly refers to across her social platforms - she even maintains a fully authentic Irish accent, albeit punctuated with an upswinging, Atlantic "right?" at the end of most sentences. "I think Irish people have a very easy way to be in those types of circles. I don’t think we do get that starstruck - we’re chatters and we like to engage with people in a really authentic way. They can be in a room with anybody, whether it’s a star or anybody and just have a conversation." Surely, though, there has to be something that fazes even the most laid back media exec I've ever encountered. I refer back to an interview Samantha Barry did when taking on the top job earlier this year in which she admitted that she sees no shame in crying in the workplace. She hadn't, at that point, had cause to shed a tear yet in Glamour... has she now? "I’ve definitely cried at least once!" she laughs while telling me. "It’s funny, it’s one of the things more people than I imagined - both people I know and don’t know - have contacted me about! "You know - I’ve had to leave people go in my job," she adds, more seriously. "I don’t do that lightly. I cry usually at work when I’m frustrated and I really want to get something done. "Sure, I’m in charge of a big team and I’m a media executive in the US, but I can rule with a femininity. Sometimes my femininity is emotional. This is a conversation I’ve been having a lot with my girlfriends. It’s a lot easier for women to embrace their femininity now and be at the top of their careers than it was maybe in the 80s and 90s where you felt like you had to be masculine to get ahead." "I do like a pant suit though!" she adds, before we call time on all 80s-inspired power dressing. When asked what she's looking for in the new wave of editors at Glamour, she looks back at her own route and pinpoints the key things that got her to her position today. "One of the things I learned and I’ve talked to the younger editors is: be open to constructive criticism. The most I’ve gotten out of any job or any boss I’ve worked with is when they come in constructively and help you how to grow. Sometimes, people, young women, don’t open themselves up to helping themselves grow with constructive criticism. Listen to those around you, your peers the people above you. Take their advice." And as for any aspiring journalists looking to crack a great job? "When I talk to editors, whether it’s at CNN or Glamour, and they tell me ‘I’m really passionate about this”, the first thing I do is look at their social footprint. If they’re coming in and telling me they want to be the wellness reporter, that they love wellness and I look at Instagram, Twitter and Facebook. If I can’t see any digital footprint they have in the wellness space, it feels like to me that they say that, but the reality is they haven’t put any effort into publishing it. "I would say to any young person looking to get into media: you have the opportunity to start your own digital footprint to show how much you care about that." Oh, and if you're looking for a hero to look up to, see: Samantha Barry, Editor in Chief US Glamour.